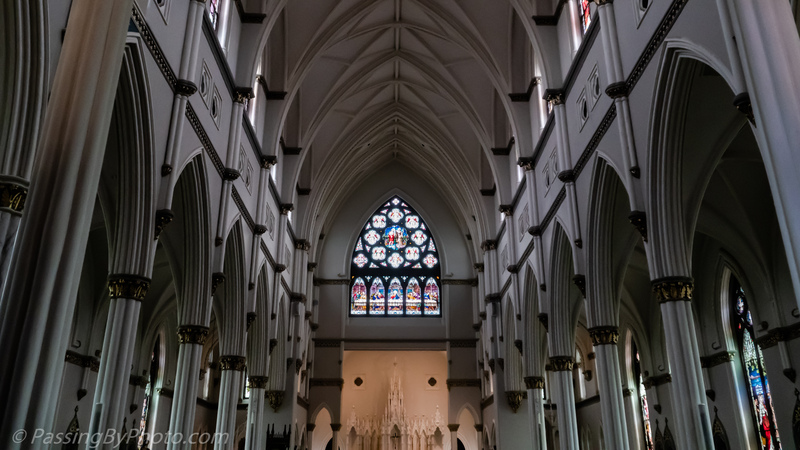 The Cathedral of Saint John the Baptist was open the day I discovered it and as I stepped inside I was somewhat overcome by the size. 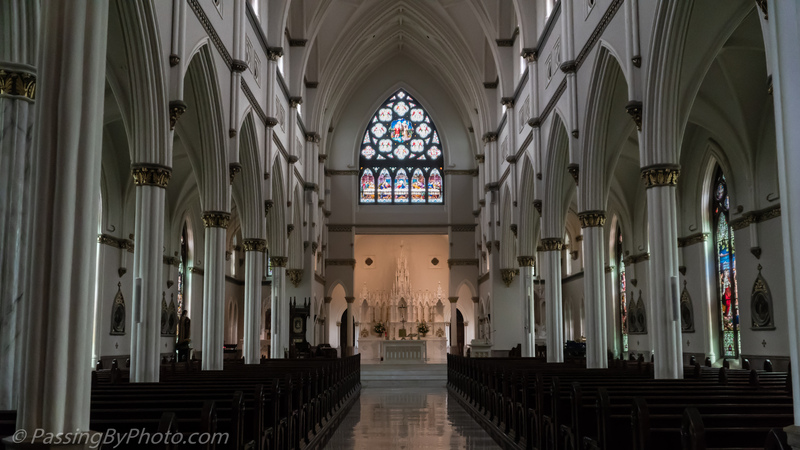 Many of Charleston’s churches welcome visitors to view their interiors, often with knowledgeable guides on hand, as well as for spiritual reasons. I saw no one here, and saw no welcome sign, either. The interior is an amazing work of art and craftsmanship. I took a few images and went on my way. 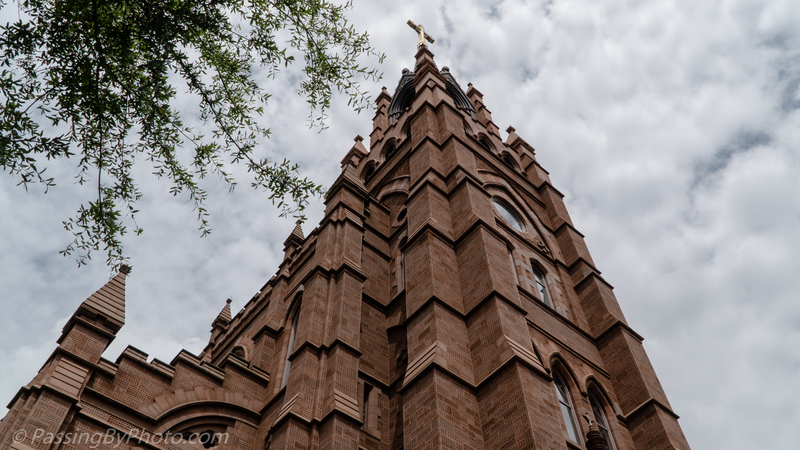 On a trip into Charleston last month I walked down a section of Broad Street that I had somehow missed before and discovered the massive Cathedral of Saint John the Baptist. 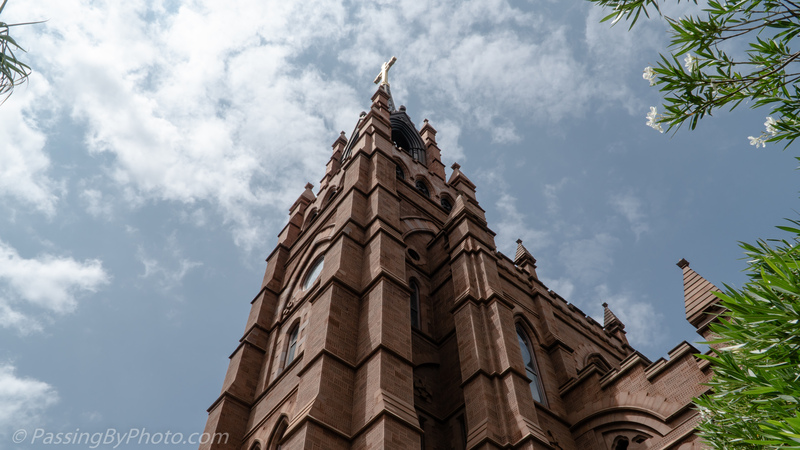 The first cornerstone for a church on this spot was laid in 1850 and an 1100 seat cathedral was consecrated in 1854. Six years later it burned to the ground in The Great Charleston Fire of 1861. 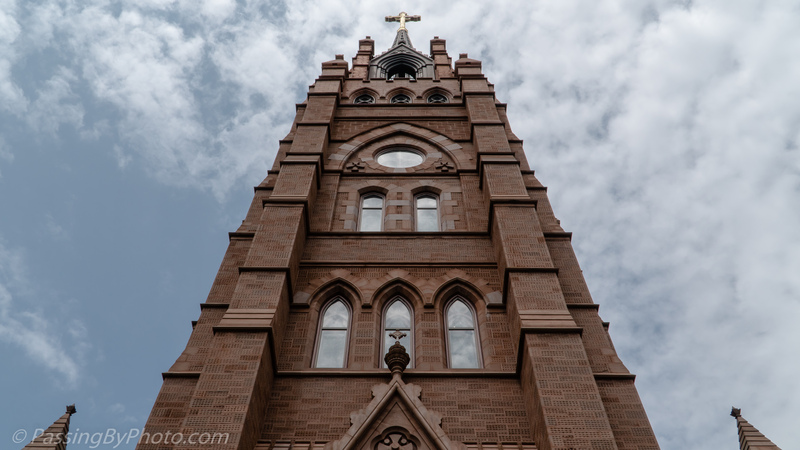 Decades of fundraising culminated in the present day Gothic building being started in 1890. Zoom in on any one of these images to see the detail of the tooling. I need to go back to capture some of the material detail. The building is impressive in its size, 200 feet long, 80 feet wide, and 167 feet to the tall. There was supposed to be a spire, but lack of funding kept that from being completed. 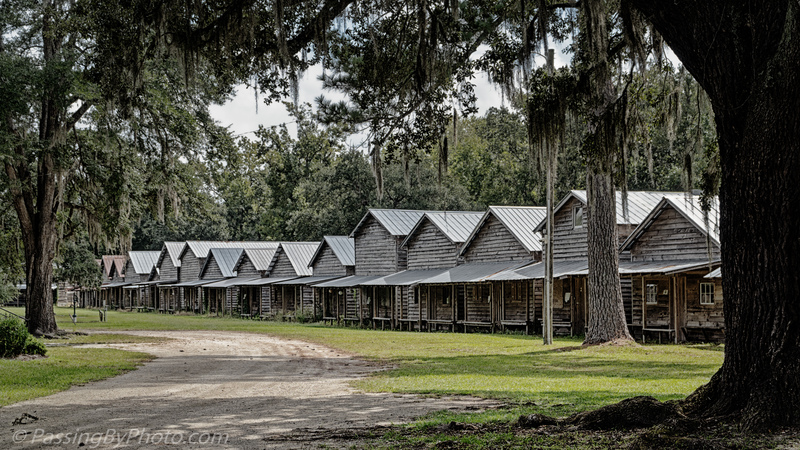 A circle of 99 rustic numbered “camps” form the Indian Fields Methodist Campground on a ten acre (four hectare) site in St. George, South Carolina. 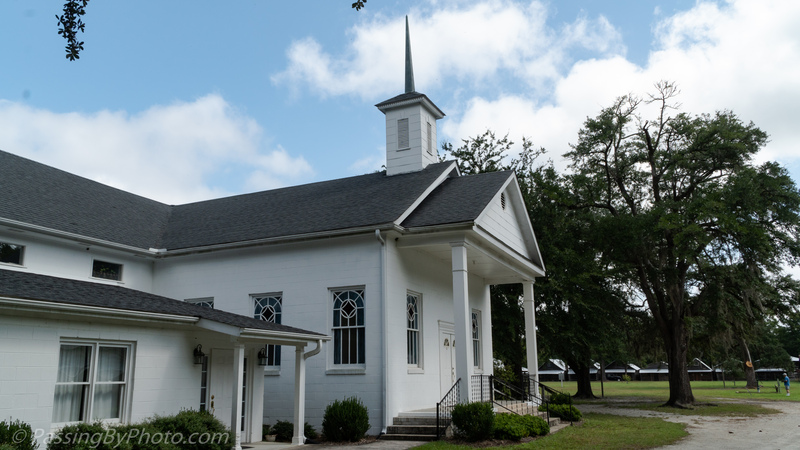 Indian Fields was built in 1848 and has been a site for religious gatherings continuously since then. This site is used just one week a year; there is electricity and running indoor indoor to sinks only. Privies, also numbered, are out back, across the road. Pine trees stand straight, towering above the camps, sentinels to the passage of time. 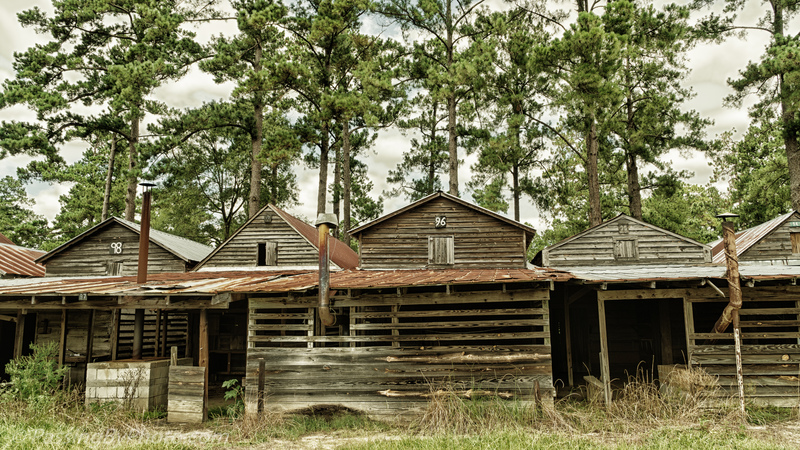 The buildings have no ornamentation and the rusting metal roofs were the only sign of color not provided by nature. 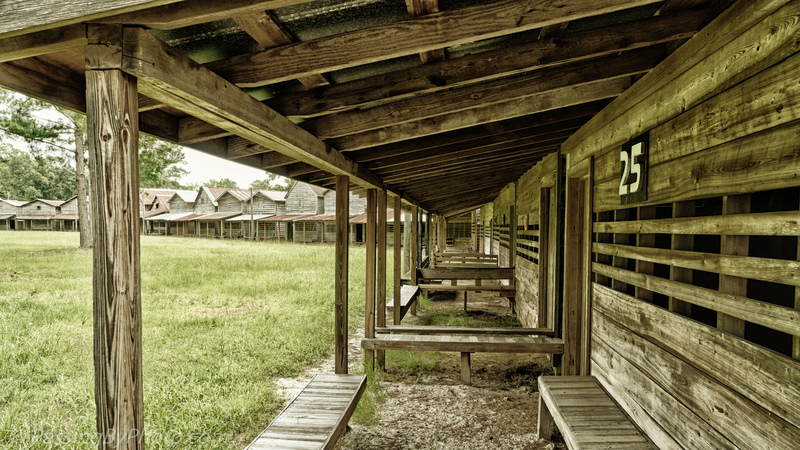 This view from the porch of camp #25 shows how meager the buildings are. Even if their doors were closed there were numerous other openings into the interiors. 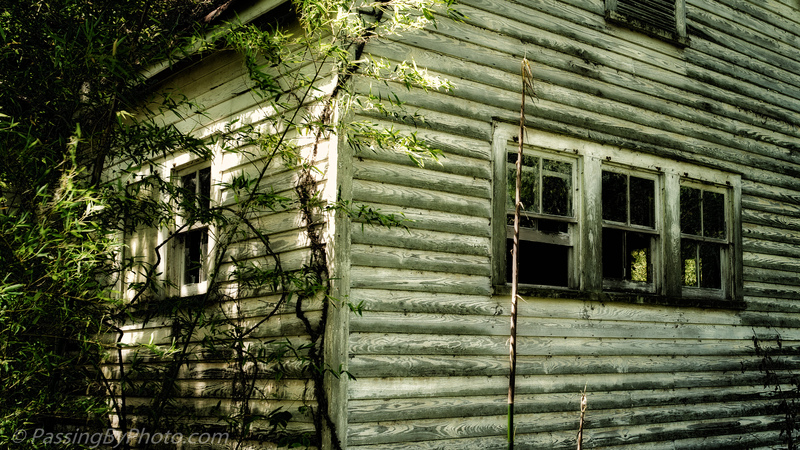 I kept expecting to get startled by a bird or other creature that had taken up residence, but saw nothing. This last view is from outside the circle where the cooking quarters all face outward to the circular road. 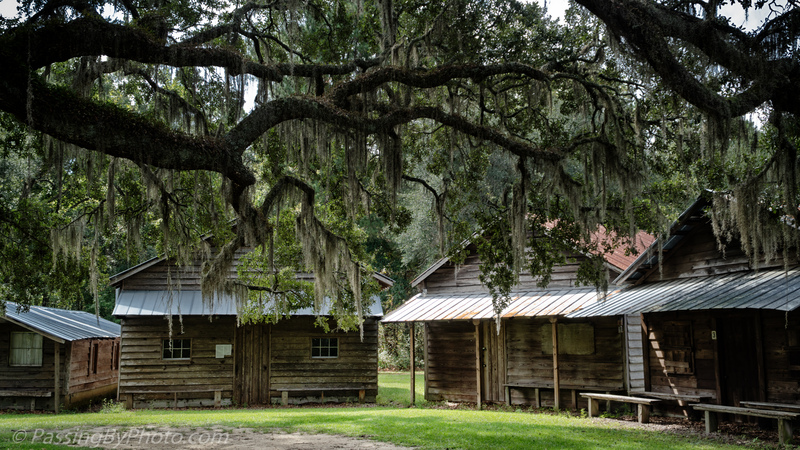 The kitchens have been modified more than other parts of the camps over time with sinks, stoves, and storage compartments. I imagine that food is a big part of the social aspect of the annual gathering. Taken 7/8/2018, Sony Alpha-6500, processed to have an old postcard look. 9/2/18 Note: I edited this post last evening to change 100 to 99 in the first sentence after Ted mentioned my error. I foolishly used the WP interface on my iPad and the post got all scrambled up and the last two images didn’t display. My apologies for presenting a mess. 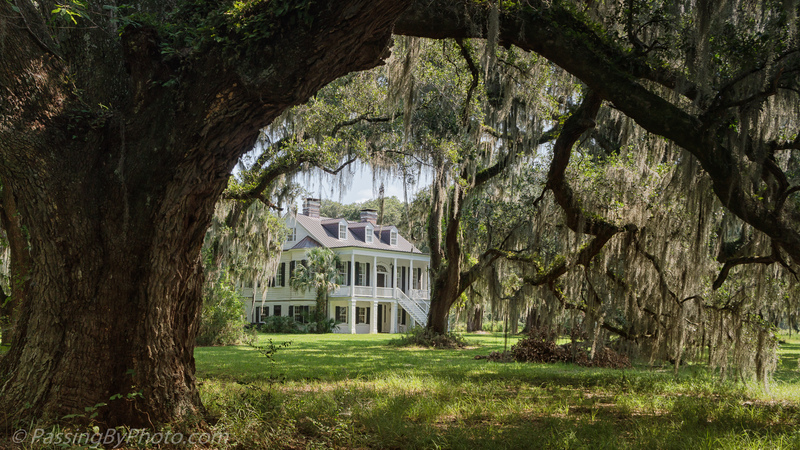 In 1825 George Washington Morris, a signer of the Declaration of Independence, became the ninth owner of the land that he named Grove Plantation. Three years later he built Grove House. These images are the front of the house, taken from the extensive tree lined lawn from the left, center, and right. 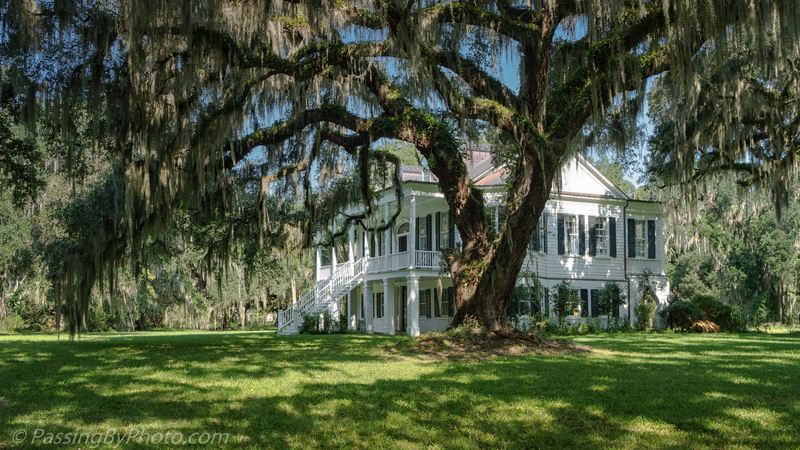 As you move away from the building the massive Live Oaks close in quickly, giving a feeling of seclusion. 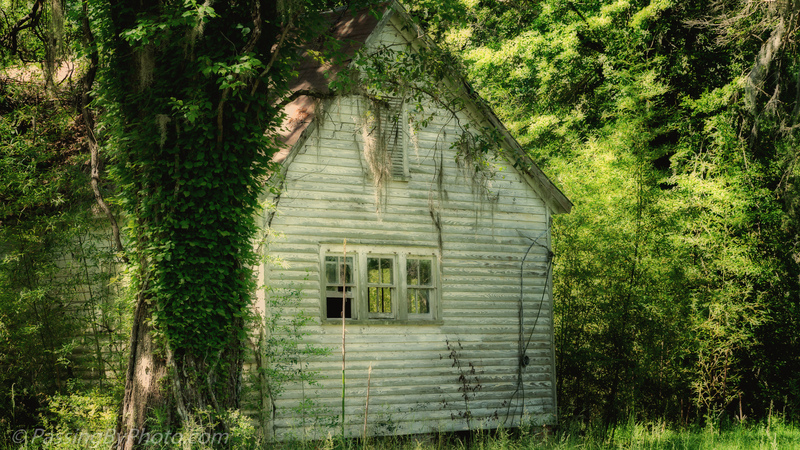 The second floor porch that runs the full width of the house is very inviting and the wide overhang would have helped keep the home cooler during the South Carolina summers. 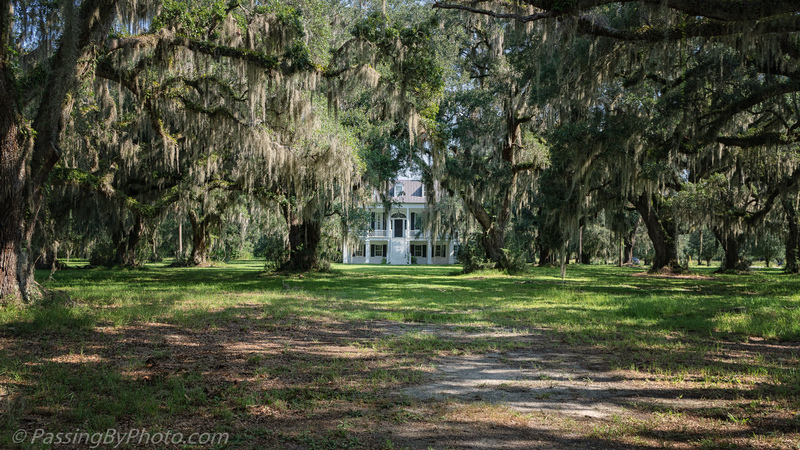 The house has survived numerous hurricanes and the wrath of the Civil War, during which many similar estates were torched. 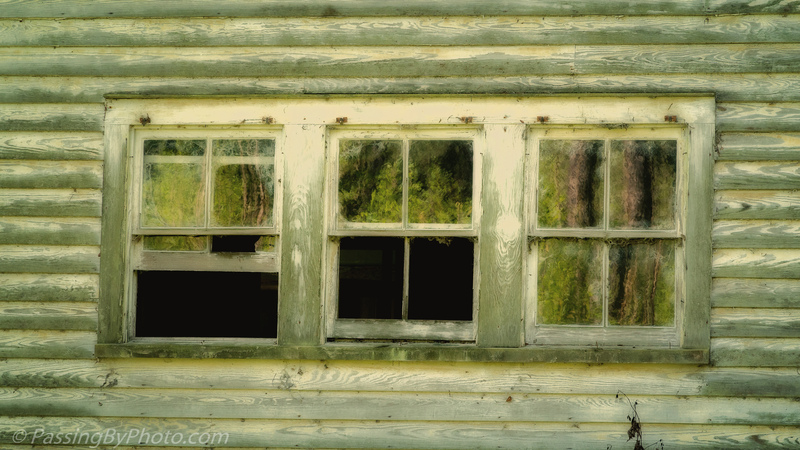 The windows on the end of the abandoned Boynton House at South Carolina’s Donnelley Wildlife Management Area intrigued me. Why three and interesting that they are lined up with the roof peak not centered in the room that appears to run front to back of the house. The reflections in the windows of a tree trunk and other vegetation was an interesting play on light. The windows facing front in the same room were a double set and appeared to be the same size.